Your morning will kick off with the most notorious stretch of whitewater in the country on AVA’s Browns Canyon trip. For a few hours, these Class III rapids will keep you paddling and gawking at the beautiful scenery through the National Monument. You’ll take a break to indulge in some hot chicken fajitas for lunch before you get geared up for the Rocky Mountain Via Ferrata course. The mountaineering portion of your day will start with ground school before you traverse along the granite cliffside high above the Arkansas River Valley. Between ascending crags, rappeling down the rock face, and the incredible views, you’ll be smiling from ear to ear after your action-packed day of adventure. Before you venture out on your Browns Canyon 1/2 Day + Via Ferrata tour, be sure to review all of the gear lists and suggested items so you aren’t missing anything the day of your outing. When you raft with AVA Rafting & Zipline, each guest will receive a wetsuit and splash jacket free of charge for your trip. 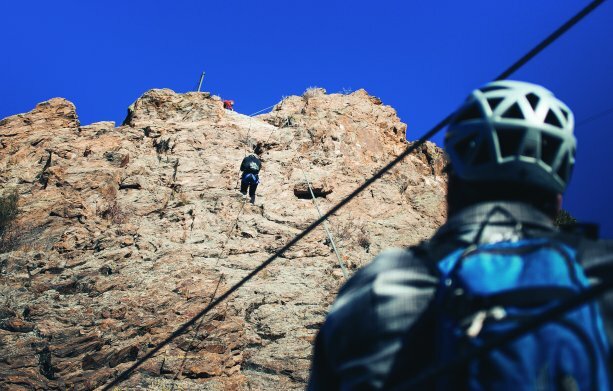 All of your gear will be provided for your Via Ferrata excursion as well, just don’t forget sunscreen for your action-packed day in the Colorado Rockies!